The Nintendo Switch is a console that prides itself on its multiplayer capabilities. Sure, if you want a more stable connection at home you need to buy an ethernet adapter that plugs into the dock(Cannot be used in handheld mode. ), but at its core, the system is designed for local multiplayer, whether at home or on the go. While the Joy-Con’s can be used as one full controller, they can be separated to create two individual controllers, allowing for two-player gaming anywhere you go, no extra controllers needed(Unless you want to play with 4 or more people, then you need extras.). 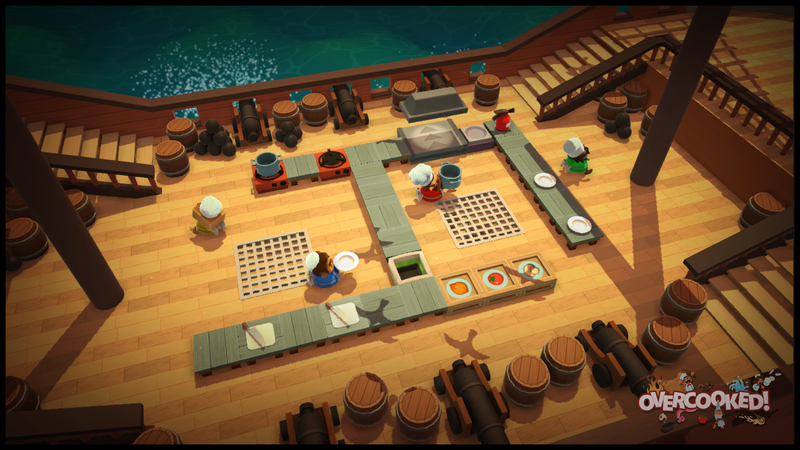 Overcooked is a game that opts for no online multiplayer, instead allowing for up to 4 players via local multiplayer. Note that when I say local, I mean on a single system. Played like this is when Overcooked is at its best and becomes a blast for parties. So, you would think that Overcooked and the Nintendo Switch would be a match made in heaven right? Well yeah, they would be... if the Switch port of Overcooked wasn’t half-baked. The biggest issue with the port is its inconsistent framerate, and we’re talking about a game that should not be that performance intensive. It’s the kind of game that is designed to run on a wide variety of systems. So its performance issues are baffling, especially when other games built on Unity have been successfully ported to the system, no problems. But I’ll be honest, that isn’t MY biggest issue with this port. My biggest issue is that it does not make effective use of the Switch’s multiplayer functionality. For a game that is effectively a party game and designed from the ground up for multiple players, it doesn’t even try to take advantage of the Switch’s unique capabilities. Like every other console that it’s on, Overcooked supports up to 4 players via local multiplayer. What it doesn’t support is either online multiplayer(Which doesn’t exist in the other versions, so not a big loss.) or LAN multiplayer. Now you may be thinking “Well, if it wasn’t in the other versions just like online multiplayer, why is it a big deal that it also doesn’t have LAN?” Why? I’ll tell you why. The Switch is a handheld, a portable device, a tablet, and it can connect to up to 8 other Nintendo Switch consoles for local wireless multiplayer. That’s a feature that really only the PC has, and unless you’re on a laptop, odds are you don’t really use it that much these days. What the PC, Xbox, and PlayStation all have in common is that they’re stationary. If you’re going to take them anywhere, you need a gym bag or something. Far more inconvenient than the Switch which can just be slotted into a purse, backpack, or even your pockets depending on how big the pockets are and if you feel like detaching the joy-cons and slipping them into another pocket. My point is, the Nintendo Switch offers more flexibility in terms of local multiplayer, something Overcooked supports and needs to actually work(Lets face it, this is not a game to be played alone.). Multiplayer on a single system is fine, but supporting the Switch’s LAN feature opens up that local multiplayer even more and is what would make this version of Overcooked the definitive version. And of course, to top it all off, the rumble support is apparently FUBAR. When one player performs an action, their controller rumbles, that is how it’s supposed to work. That rumble is not supposed to translate to every other controller connected to the system. But in the Switch version, it does. And it isn’t even the HD rumble that Nintendo is so proud of and that I have been repeatedly impressed by. I feel like Overcooked would be the perfect game to take advantage of the HD rumble, but of course the rumble would actually have to work properly to begin with. If the developers can roll out a patch that fixes the framerate issues and the basic rumble functionality(Which they are reportedly doing. ), they’ll be one step closer to having a good port. But to really get that amazing, definitive version, they need to at least patch in support for LAN multiplayer, really take advantage of what the Switch has to offer, that the other platforms do not.